Today, rather than posting my own thoughts of Life and Leadership, I am posting a fantastic article on the art of transition. In my keynote speech in October 2016 in Aspen, at the “Lead with Love” conference at the Aspen Institute, I spoke to this very same idea. As leaders we must find ways to stay in the transition, and even moreover, learn to love the feeling of transition. Sometimes I feel that my life is a series of trapeze swings. I’m either hanging on to a trapeze bar swinging along or, for a few moments in my life, I’m hurtling across space in between trapeze bars. 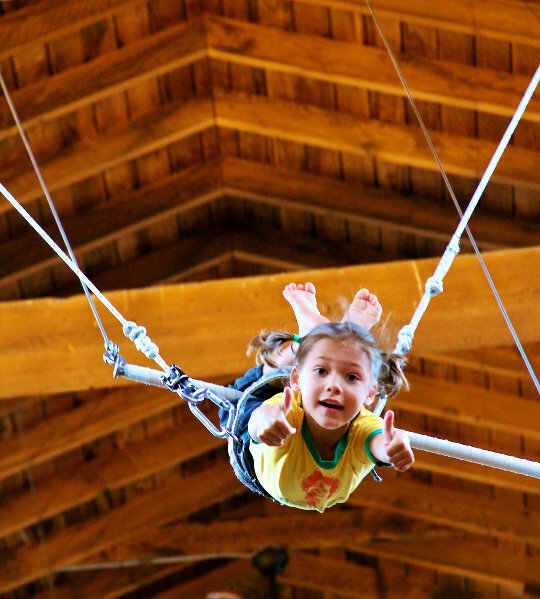 Most of the time, I spend my life hanging on for dear life to my trapeze-bar-of-the-moment. It carries me along at a certain steady rate of swing and I have the feeling that I’m in control of my life. I know most of the right questions and even some of the answers. But every once in a while as I’m merrily (or even not-so-merrily) swinging along, I look out ahead of me into the distance and what do I see? I see another trapeze bar swinging toward me. It’s empty and I know, in that place in me that knows, that this new trapeze bar has my name on it. It is my next step, my growth, my aliveness coming to get me. In my heart of hearts I know that, for me to grow, I must release my grip on this present, well-known bar and move to the new one. Each time it happens to me I hope (no, I pray) that I won’t have to let go of my old bar completely before I grab the new one. But in my knowing place, I know that I must totally release my grasp on my old bar and, for some moment in time, I must hurtle across space before I can grab onto the new bar. It’s called “transition.” I have come to believe that this transition is the only place that real change occurs. I mean real change, not the pseudo-change that only lasts until the next time my old buttons get punched. I have noticed that, in our culture, this transition zone is looked upon as a “no-thing,” a noplace between places. Sure, the old trapeze bar was real, and that new one coming towards me, I hope that’s real, too. But the void in between? Is that just a scary, confusing, disorienting nowhere that must be gotten through as fast and as unconsciously as possible? NO! What a wasted opportunity that would be. I have a sneaking suspicion that the transition zone is the only real thing and the bars are illusions we dream up to avoid the void where the real change, the real growth, occurs for us. Whether or not my hunch is true, it remains that the transition zones in our lives are incredibly rich places. They should be honored, even savored. Yes, with all the pain and fear and feelings of being out of control that can (but not necessarily) accompany transitions, they are still the most alive, most growth-filled, passionate, expansive moments in our lives. So, transformation of fear may have nothing to do with making fear go away, but rather with giving ourselves permission to “hang out” in the transition between trapezes. Transforming our need to grab that new bar, any bar, is allowing ourselves to dwell in the only place where change really happens. It can be terrifying. It can also be enlightening in the true sense of the word. Hurtling through the void, we just may learn how to fly. How to create momentum and freedom in life and business? © 2019 McGhee Leadership. All Rights Reserved.